We take utmost care to protect our WordPress websites against brute force attacks, hosting downtime, and malware. But what if the website is compromised or the data is lost in spite of the security measures taken? One aspect of website/blog maintenance people often overlook is backing it up to dodge any data loss. Hours of hard work can vanish within seconds due to unforeseen events. Having a backup of the website can always be a great relief in such situations. All the loss can be recovered in a matter of few clicks. Thankfully, backing up a WordPress website does not need you to be a geek. Just like most other tasks in WordPress, backing up the site can be a cake walk. Moreover, you need not invest in a server space to store the backups. The backup can be stored on the cloud or even in your email inbox. Here you will be learning how to backup WordPress website to your Dropbox account which is a cloud based app. With their free account you will get 2GB of free space which is decent for any mid level WordPress blog backup. If you don’t have an account on Dropbox yet, click here to get one along with extra 500MB space. What files to backup for a perfect WordPress recovery? “Everything” you may say. But anything extra in the backup will take extra storage. So it is important to know which part of the website needs a backup and which does not. Database, which comprises of pages, comments and posts; i.e., everything textual. Avoid backing up plugins like spam filters and stats plugins which just add bloat to the backup file. Also don’t backup your cache folder, as it tends to increase the size of total backup & doesn’t really help much. There are a handful of WordPress plugins both free and premium that allow backing up a WordPress website. One of the most used free plugin for WordPress dropbox backup is BackWPup. It is one of the highest rated plugins in WordPress plugin directory. 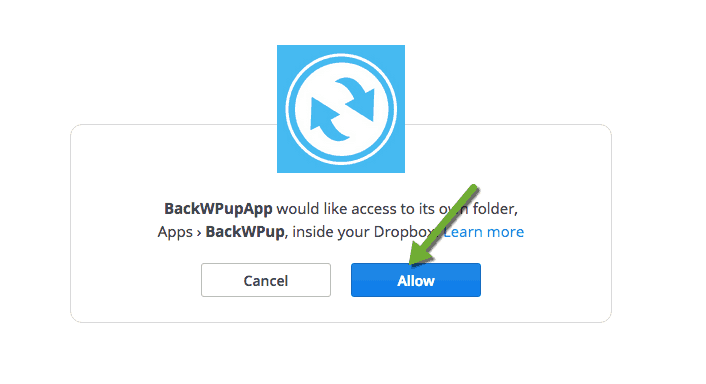 Before I share the tutorial on using BackWPup plugin for taking your WordPress blog back on Dropbox, first have a look at notable features of this plugin. Availability of backup log files. Automatic or manual backup as per your preference. Choosing which plugins and files to backup. Install the BackWPup Plugin from the WordPress plugin directory. From the Dashboard’s left sidebar, select Plugins and then hit Add New. Search for BackWPup plugin and install it. Once installed, Activate the plugin. You will see the plugin in the installed plugins section of your WordPress. Also, the dashboard sidebar contains the BackWPup tab upon successful installation. 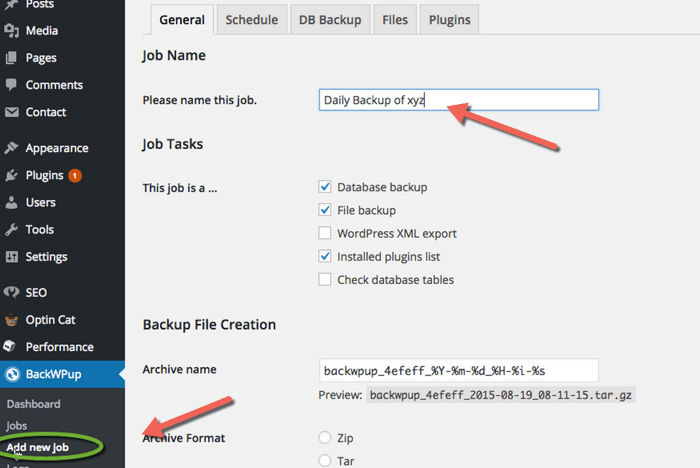 Now you need to configure the plugin for generating automatic scheduled backups. The configuration involves choosing what needs to be backed up, at what time and how often, and located in which destination. To start with, go to Add New Job under the BackWPup tab in the dashboard sidebar. Under the General tab, name the backup. We shall call it ‘Daily Backup of xyz’. Check database backup (posts, comments, pages), file backup (themes, multimedia) and installed plugins list. In the same tab, leave Backup file Creation settings to default and check Backup to Dropbox. You may want to enter email address to receive backup log files. This is optional though. Save the changes now and click the next tab i.e., Schedule tab. We now automate the backup job we just created. Select the radio button against with WordPress Cron and scroll down to select daily to set the hour at which the backup job will be executed. Save your changes. You can skip the next three tabs i.e., DB backup, Files and Plugins which allow you to set which databases, files and plugins to backup. These can be left to default. Now login to your DropBox account in another tab. Come back to WordPress to select the To:Dropbox tab. Here, you get to connect the BackWPup plugin to Dropbox. Click on the Get Dropbox App auth code. This leads you to a new browser tab asking you to allow access. Just clink Allow. A code populates on the screen which you need to copy in the App Access to Dropbox text area. Upon saving the change, an authentication confirmation appears on the screen. This implies that the backup job will be performed daily and the file shall be stored in your Dropbox account. This file can be used to restore the website in case of any exigencies. Using BackWPup is one of the best ways to create a Backup of your WordPress website with no apparent budget allocated to it. Hope this tutorial helped you. You may discuss any doubts and ideas in the comments. Hey that is a great tutorial. I never really looked into automating this process. I have been using so far another great plugin, (but no automation to dropbox). I will seriously consider doing this as well since one tends to forget the back ups sometimes…! You made a lot easier by sharing this article.